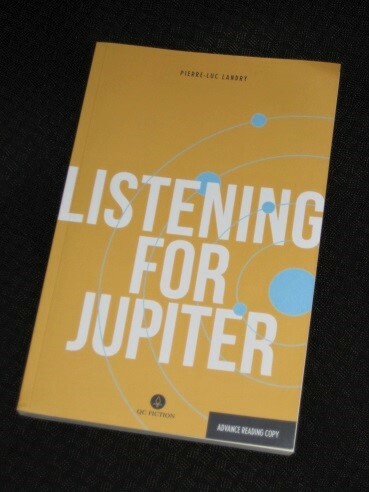 Pierre-Luc Landry’s Listening for Jupiter (translated by Arielle Aaronson and Madeleine Stratford, review copy courtesy of the publisher) follows two very different people from very different worlds, who nevertheless find themselves connected in a rather unusual way. Xavier lives in Toronto, but his job as a sales rep for a major pharmaceuticals company keeps him on the road most of the time. The novel begins with him battling through a blizzard to make it to his London hotel, and once he’s finished in the UK, it’s off to an unseasonably snowy Bilbao for another important pitch. The main characters of the novel are two people looking for something, and Xavier is particularly disillusioned with his job. While rich, he’s also unfulfilled, as well as being addicted to painkillers and sleeping pills. Hollywood, on the other hand, is literally a youth without a heart, with a metal box having replaced the defective organ, causing him to occasionally cramp up in pain. Their crumbling lives are reflected in how the real world is falling apart, with climate change doing strange things to the weather (although we’re never quite sure how there can be heatwaves and snowstorms at the same time). I had the same dream again. I say ‘the same’, but that isn’t true. It never happens in exactly the same way. And the conversations are always different. I have this recurring dream so often it makes me wonder: Who is this guy I only see at night? The next time he appears, I’ll ask him. Yes: tonight, I’ll ask his name. Whenever they sleep, they meet, usually wherever Xavier happens to be, and they sit on his hotel bed, wondering how they came to be there. Later, when both experience health issues, they’re able to prolong their time together at a neutral venue, but sooner or later they must awaken and return to the real world. The reader wonders whether they’ll ever be able to connect in a waking state, but that’s not the way Landry’s mind works – what if the dreamworld is more real than the real thing? The novel has a beautifully crafted, languid style, perfect for watching people drifting in an uncertain world. Its title is taken from the documentary on Jupiter that the pair watch repeatedly, both fascinated by the eye of the never-ending storm. Eventually, they’re tempted to listen for the sounds of the giant planet, with the prospect of hearing echoes of Jupiter putting trivial human affairs to shame. When added to the havoc climate change is wreaking across North America, there’s a sense that individual lives count for little in the grand scheme of things. Saké took a bite of the cucumber she was holding. I loved the book despite the occasional confusion, but I did have one issue with it. For me, the character of Gia was overplayed, with her later (non)appearances making for some of the weaker sections, and the ending didn’t quite work. Brothers, another book where the reader spends most of their time wondering what’s going on, manages to nail the landing perfectly, creating a suitably ambiguous finish to a wonderful story. Listening for Jupiter tries to tie things together too neatly and in doing so slightly detracts from the effect Landry had created, one clumsy page jarring in the smooth overall structure. I’d chalk it up as another success for a young publisher building a brand (c.f. Peirene Press, And Other Stories), with the blending of voices by the two translators building on their promise to do things differently. Simon – That was actually my issue with that final mention of Gia, as it ties up loose ends that should be left dangling! I think I agree, but I’ll have to reread the end. It’s hard to talk about it without getting into spoilers. But generally speaking I’m all for dangling loose ends! Despite your reservations, this sounds interesting. I’ll certainly explore further (Brothers too).